Spending the holidays in Hellas? Travel to Greece in December and January provides off-season discounts, light crowds, good air quality in Athens, and rich and moving Christmas pageantry, followed by New Year's celebrations and Epiphany. The holidays in Greece are special times, beginning with the feast of St. Nikolaos on December 6, when many Greeks exchange gifts. In comparison with most Western European countries, Greece's celebration is still solemn and moving, a time for faith and family, with blissfully few of the commercial trappings visitors are accustomed to seeing elsewhere, though they are increasing every year. It's a good reason to go now. Without much support from the beleaguered Greek government, celebrations are in the hands of the cities and towns themselves. In Athens, Syntagma Square will be decorated with ornaments made by schoolchildren with a Christmas "tree" created by art students. Empty shop windows, of which there are, sadly, many more than in the mid-2000s, will serve as temporary art display spaces. Overall, there will be displays and activities in the three main squares of Syntagma, Kotzia, and Klefthmono, at various places in the neighborhoods of Athens, and at cultural centers. Up in Florina, December 23 and 24 see a traditional holiday Bonfire Festival held at Agios Panteleimonas, near Amynteo. Remember that weather may be a factor in travel. Florina is about a two-and-a-half-hour drive from Thessaloniki. On New Year's Eve, look for a free city-sponsored concert and fireworks. Many businesses, sites, and museums will close irregularly through the holiday season. Officially, the actual dates of December 25 to 26 and January 1 are the only ones supposed to be affected - but please check before making final plans. There will usually be a small travel crunch just before Christmas and just after January 1 and again after January 6, as some Greeks go home for the holidays and then return to Athens. This year, due to the financial crisis, Greeks may not be traveling quite as much for the holidays, so the more casual visitor will probably find space on planes and ferries. Events: Athens arts events. Feast of St. Nicholas on Dec. 6th. New Year's Day and Epiphany bring light to January. 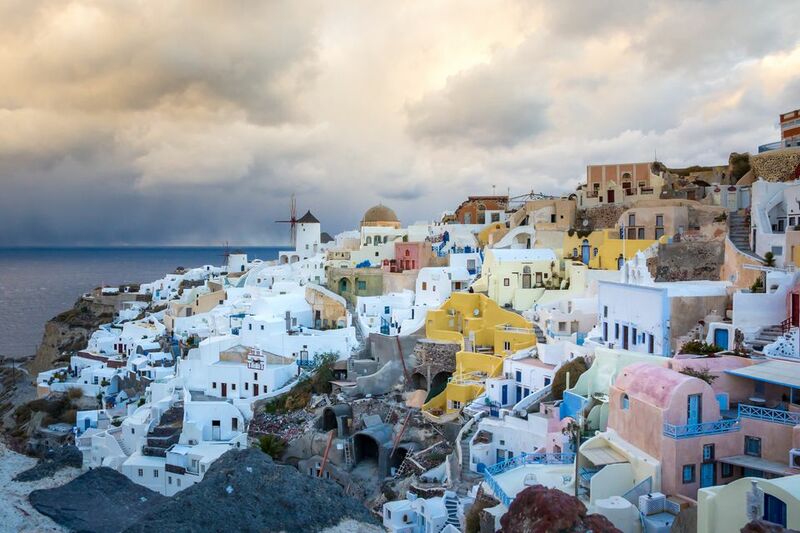 Facilities: The smaller Cycladic islands, more remote islands, and many others are virtually closed, with few hotels and restaurants remaining open and infrequent ferry service that makes island-hopping difficult. Travel between isles is limited. But in the mountains, depending on the snow situation, the ski season usually begins, and you can take a peek through many winter resort webcams in Greece. Mainland Weather: Cold and wet; snow in the mountains. Island/Coastal Weather: Cold, wet (sometimes even snowy), and windy. Sunny, pleasant days are usually very limited. Events: Many events, mainly aimed at Greek aficionados of the arts. There are New Year's celebrations, then Epiphany on Jan 6th. Plays, concerts, etc. are on in Athens and Thessaloniki, as well as many other locations. Facilities: Hotels and restaurants on many islands will be closed. The ski season is in full swing, though bad weather may interfere. Port visits by tender from cruise ships may be canceled due to rough water. New Year's Eve is celebrated more and more vigorously in Athens and elsewhere, and larger hotels usually host a party. On the island of Chios, ship models are created and carried around by groups of fishermen singing songs. January First is the Feast of St. Basil when many Greeks practice the old custom of slicing a piece of the Vassilopita (Basil Cake) in hopes of finding a lucky coin concealed by the baker. Though St. Nikolaos may seem to be a more obvious inspiration for Santa Claus, it's St. Basil who visits with gifts on this day. Playing cards on a table covered with lucky green felt ​are also supposed to assure abundance the whole year through. Epiphany celebrations in towns by the sea or by rivers will include the local priest throwing a cross into the waters, where it is retrieved by intrepid young men who dive for it in the frigid waters, a blessing of the waters which dates back to ancient times. As the day of the baptism of Jesus, many Greek Orthodox families arrange children's baptisms for this day. If you're in the Athens area, Piraeus has a particularly lavish ceremony. On January 8th, a few remote villages practice role-reversal, with the women pursuing male activities (mainly consisting of drinking coffee at the kafeneions and playing cards) while the men attempt to fulfill the women's roles at home. An evening celebration follows as things return to "normal" for another year - and possibly some new understanding lingers, at least for a few months! Is Santa Claus a Greek?